In war, nothing is holy. 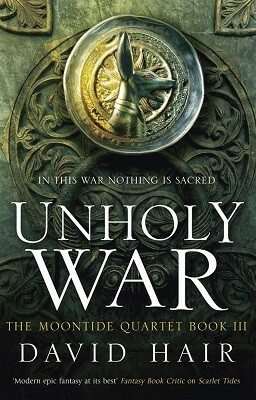 The third in David Hair's epic Moontide Quartet, perfect for fans of Brandon Sanderson, George R.R. Martin and Robert Jordan. Emperor Constant's crusade is teetering on the edge of disaster. In the wake of a devastating battle, everything has changed: the East is rising, bringing equal measures of hope and despair to Urte. For Elena and Kazim, the victory is a call to arms against the renegade spymaster Gurvon Gyle. For the Queen of Javon, it is a beacon as she seeks new ways to overthrow her usurper husband and reclaim the country for her brother. For Ramon, trapped behind enemy lines, it is one more obstacle in his desperate attempt to get his men safely home. And while the armies of East and West clash in ever-more-bloody conflict, emperors, inquisitors and assassins hunt the Scytale of Corineus, the key to ultimate power, which is in the hands of the most unlikely guardians: failed mage Alaron and market-girl Ramita, pregnant widow of the world's greatest mage. What they choose to do with the Scytale could change Urte forever.